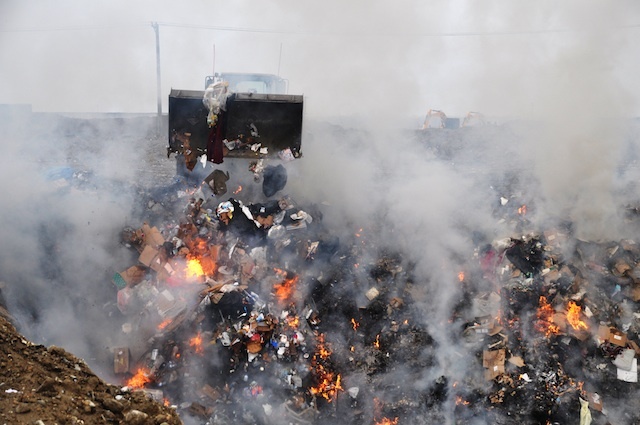 For years, U.S. government agencies have told the public, veterans and Congress that they couldn’t draw any connections between the so-called “burn pits” disposing of trash at the military’s biggest bases and veterans’ respiratory or cardiopulmonary problems. But a 2011 Army memo obtained by Danger Room flat-out stated that the burn pit at one of Afghanistan’s largest bases poses “long-term adverse health conditions” to troops breathing the air there. The cause of the health hazards are given the anodyne names Particulate Matter 10 and Particulate Matter 2.5, a reference to the size in micrometers of the particles’ diameter. Service personnel deployed to Bagram know them by more colloquial names: dust, trash and even feces — all of which are incinerated in “a burn pit” on the base, the memo says, as has been standard practice in Iraq and Afghanistan for a decade. Accordingly, the health risks were not limited to troops serving at Bagram in 2011, the memo states. 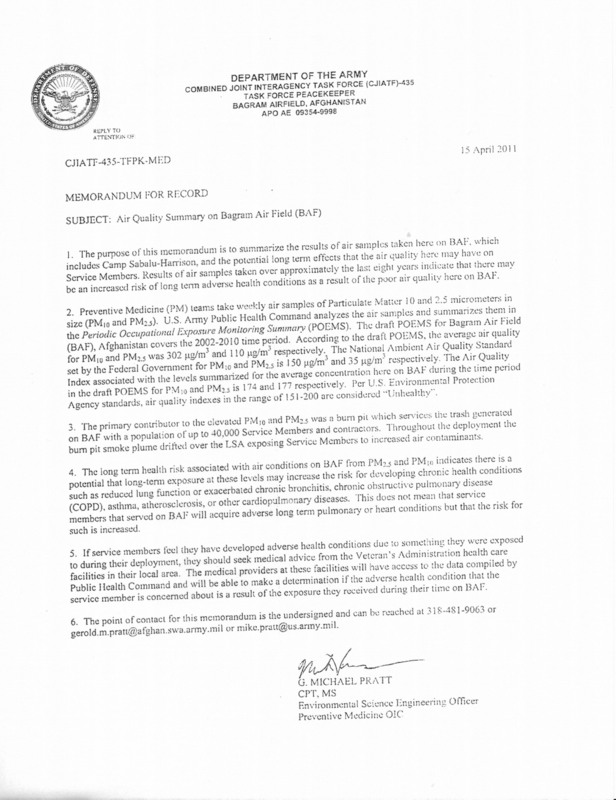 The health hazards are an assessment of “air samples taken over approximately the last eight years” at the base. The UN have declared Kabul a “White City” Highest Security Status effective immediately. This means all movement for UN staff have been immediately suspended within Kabul and more than likely all of Afghanistan. The UN Claims that there has also been an increase in security threats specifically along the Jalalabad Road corridor, the most likely targets will be the military installations, international military, Afghan military and Police, government buildings, UN complex, and the Green Village as the obvious targets. “Unfortunately, the one in front came down for an unknown reason,” he said. Turkey’s military says one of its helicopters has crashed into a house on the outskirts of the Afghan capital Kabul, killing 12 Turkish soldiers. Authorities say the Sikorsky helicopter crashed into the house Friday in the Bagrami district. 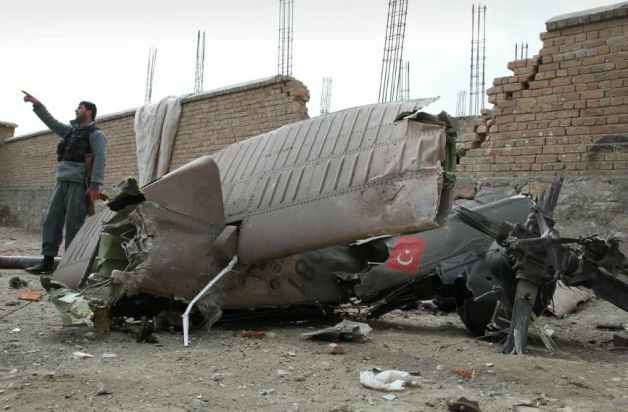 The Turkish military said the aircraft belonged to the Turkish armed forces and was part of the NATO mission in Afghanistan. In eastern Afghanistan, NATO says one of its service members died Thursday in a bomb blast. –The Taliban claimed responsibility for an attack Saturday inside the Afghan interior ministry that killed at least two American officers. NATO and Afghan officials reported the deaths of two American officers inside the ministry in Kabul. According to the International Security Assistance Force, initial reports indicated that “an individual” turned his weapon against NATO service members. The firm said Thursday that it was cooperating with the Afghan investigation. A statement indicated it did not own the AK-47s but was in the process of buying them through legal channels. Both Britons work for a private company that provides security for foreign installations in Kabul, according to an official from Afghanistan’s National Directorate of Security, who spoke on the condition of anonymity. Two British private security contractors have been arrested in Afghanistan after they were stopped by police with 30 AK-47 assault rifles in their vehicle. The men were buying weapons from two Afghan arms dealers who were arrested at the same time, a private security source close to the situation told the Daily Telegraph. The four men were transporting the weapons to a range to test fire them before the deal was finalised, the source said. Mohammed Zahair, of the Kabul police, said the men were stopped as they drove from the airport towards the Jalalabad road. Ayoub Salangi, the chief of police in Kabul, said some of the weapons did not have serial numbers or the numbers had been removed. “We asked the company to show their licence but they are yet to do so,” he added. It is understood the firm claims that paperwork was filed with the Ministry of the Interior notifying them of the deal. “The British Embassy is in contact with the Afghan authorities and stands ready to provide consular assistance,” the spokesman added. Two British nationals have been detained in the Afghan capital in possession of dozens of AK-47 assault rifles with the serial numbers erased, a government official said Tuesday. “Two British nationals along with their two Afghan colleagues, a driver and a interpreter, were today detained carrying 30 AKs. The weapons’ registration numbers were removed from them,” the official, who requested anonymity as he was not authorised to speak to the media, told AFP. Kabul police chief Mohammad Ayoub Salangi confirmed that four people had been detained while carrying weapons. He would not disclose their nationality and said the case was under investigation. The government official who spoke to AFP said the Britons were arrested in an area of Kabul where foreign forces have bases and facilities. The British embassy said it was “aware of reports that British nationals may have been detained in Kabul”. “Our consular officials in Kabul are in touch with the relevant Afghan police authorities to seek further information,” a spokesman told AFP. Afghanistan is home to thousands of foreign private security personnel providing services for foreign troops, diplomatic missions and aid organisations. A US congressional report last year found that the number of private security personnel working for the US military in Afghanistan rose to 18,919 at the end of 2010, the highest level used in any conflict by the United States. Around 95 percent of them were Afghans, it added. But relations with the authorities have deteriorated. President Hamid Karzai accuses the firms of breaking the law and taking business away from Afghans. The British contractors were working for the Texas-based construction and engineering firm Fluor, which has extensive contracts with Nato forces in Afghanistan, including managing essential facilities on army bases all over the country. Fluor Corp., a company based in Irving, Texas, that employs contractors in Afghanistan, confirmed on Sunday that some of its employees, including the two British nationals, were killed in the attack. 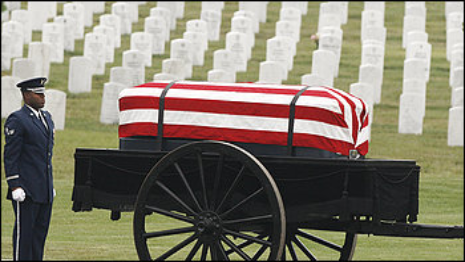 Their names were not being released out of respect for their families, said Keith Stephens, a company representative. Two British civilians were among 17 people killed in a Taliban car bomb attack on a military convoy in Kabul on Saturday. The two electricians, who have not been named, were travelling in a heavily armoured Rhino bus in the western outskirts of the Afghan capital when the vehicle was rammed by a Toyota Corolla believed to have been carrying 700kg of explosives. Four US soldiers, five US civilians, a Canadian soldier, a Kosovan civilian were killed as well. Four Afghan civilians near the scene also died in the blast, which smashed windows in buildings up to half a kilometre away. One of the bodies has already been flown out of Afghanistan, a western official said, while the second was due to be flown out on Sunday after a ceremony at Bagram air field, to the north of Kabul, which was due to be attended by senior military officers and diplomats. It is not known which project the men had been working on, but it is thought that the bus – which was being escorted by other armoured vehicles – had just left the counter-insurgency school run by Nato at Camp Julien in the west of the city and was heading for Camp Phoenix, a US base involved in training Afghan soldiers and policemen. KABUL, Afghanistan — Britain’s Foreign Office says two British civilians working for a building contractor were among the victims of a weekend suicide bombing of a NATO convoy in Kabul that killed 17. A Taliban suicide bomber rammed a vehicle loaded with explosives into an armored NATO bus on a busy thoroughfare in Kabul on Saturday, killing five NATO service members, including one Canadian soldier, eight civilian contractors and four Afghans. Earlier it was reported that the five soldiers and eight contractors killed were all American. The British ministry said Sunday that the families of the two civilians have been informed. KABUL, Afghanistan — At least 12 Americans were killed when a Taliban suicide car bomber attacked an armored shuttle bus in Kabul on Saturday, military officials said. The bombing was the single deadliest assault on Americans in the capital since the war began, military officials said, and follows brazen Taliban attacks on the American Embassy and NATO headquarters in the city last month. A Western defense official said at least four of the dead Americans were G.I.’s and the rest were contract workers; a Canadian soldier and four Afghans were also reported to be killed. The attack Saturday and the other high-profile assaults are seen as a shift in Taliban strategy as the militants struggle against a surge in American troops that has loosened their grip on the Taliban heartland in the south and compromised their ability to stage more conventional attacks on NATO forces. The explosion, which occurred as the convoy was passing the American University, sparked a fireball and littered the street with shrapnel. Heavy black smoke poured from burning wreckage at the site. The armored personnel carrier, known as a Rhino, was sandwiched between of a convoy of mine-resistant military vehicles traveling on a four-lane highway frequently used by NATO forces in a southwestern section of the city. NATO said 13 service members were killed, but a U.S. official confirmed they were all Americans. The official spoke on condition of anonymity because of the sensitivity of the issue. The Afghan Ministry of Interior said three Afghan civilians and one policeman also died in the attack. Eight other Afghans, including two children and four other civilians, were wounded, said Kabir Amiri, head of Kabul hospitals. The Taliban claimed responsibility for the Kabul attack, as well as for another suicide bombing outside a government intelligence office in the northwest province of Kunar. The U.S. Embassy issued an emergency message about the series of attacks across Kabul on Tuesday, saying “the situation is uncertain and ongoing. There are media reports that many roads are closed in Kabul.” It said appointments for visas or U.S. citizen services have been canceled for now and it said Americans in Afghanistan should monitor the websites of the embassy and the State Department’s Bureau of Consular Affairs for the latest information. “We urge U.S. citizens to shelter in place, avoid unnecessary movement, and to avoid the neighborhood around the U.S. Embassy: Wazir Akbar Khan, Microrayon, and Massoud Circle,” it said. Two New Zealand SAS soldiers were wounded yesterday as they battled a deadly Taleban suicide raid in Afghanistan. Prime Minister John Key said last night the men played a “crucial” role in thwarting the terrorist attack that left at least 10 civilians dead at the Inter-Continental hotel in Kabul. At least six suicide bombers stormed the five-storey building about 9pm local time (5am NZ time). Once inside, they went from room to room, attacking the residents, before taking over the roof of the building. At least 10 Afghan civilians were killed in the battle, which ended when a Nato helicopter attacked the militants on the roof, killing them all. Mr Key said a “handful” of New Zealand’s SAS troops – fewer than a dozen, he thought – went to the raid with the Afghani Crisis Response Unit in a mentoring role to observe. SAS forces are in Kabul to train local forces with a view to handing back security responsibilities soon. “The incident obviously escalated,” the Prime Minister said. 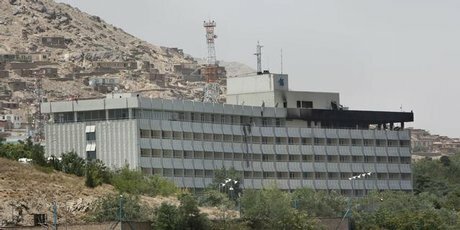 The popular Intercontinental hotel in Kabul has come under a suicide bombing attack Tuesday, a U.S. official told Fox News. The attack is still ongoing. Afghanistan news agency TOLOnews is reporting at least 10 people have been killed. That number has yet to be independently confirmed. Up to six suicide bombers are believed to have attacked the hotel, Afghan police tell Fox News. Multiple explosions have been heard at the hotel. Afghan police were battling the assailants with machine-gun fire and rocket-propelled grenades as tracer rounds went up over the blacked out building. Afghan National Police have secured the area around the hotel. Kabul’s police chief says at least three of the suicide bombers blew themselves up. Streets leading to the Intercontinental hotel are blocked. “It’s an attack on the Intercontinental Hotel. There are several gunmen shooting,” Kabul criminal investigations chief Mohammad Zahir told AFP. He said “a number” of police had been wounded. Azizullah, an Afghan police officer who uses only one name, told The Associated Press at the scene that at least one bomber entered the hotel Tuesday night and detonated a vest of explosives. Jawid, a guest at the hotel, says the attack occurred as many people were having dinner in the hotel restaurant. He says he heard gunfire throughout the several story building. That is a sad reality of both NATO and United Nations peacekeeping missions.